Although Latour’s contentious book is a mere 145 pages long (in fact he calls it an essay), the notion that, after one reading, this fledgling researcher is qualified to review this for you feels like hubris. However, We Have Never Been Modern reads like a manifesto and, as such, the pages call for a response. Latour is known as a thinker within the canny niche known as science studies. It is a branch of enquiry which shares with anthropology an interest in human cultures and examines networks in order to grasp the impact, and limitations, of science. Put this way, science studies appears to be a somewhat marginal endeavour. 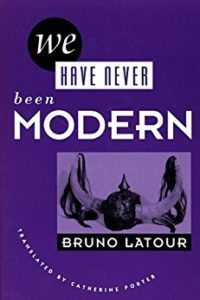 But the arguments set out in this title, put the specialised discipline centre stage as Latour gets to grips with the differences between premodern societies and the modernism in which technology seems to have wrenched us away from nature. (That’s an oversimplification to be sure). Unsurprisingly this is one of the easiest passages in a thesis which, at times, is so topographical that only a scientistic diagram will do. Indeed Latour uses diagrams to map the relations between nature and society, different types of relativism, principles of asymmetry between nature and society, the origins of the divide between nature and society, and so on. If these visuals and the dogged investigative text have a single message, it might be this: the perceived divide between the West and the rest of the world comes down to a rupture brought about by revolutions in science. These changes in the Western self image, date back to Hobbes and Boyle and their experiments with the air pump in the 1660s. There is a scientistic culture originating with these findings, which now sets us apart from the world’s various ‘primitive’ or premodern peoples. So the circumstances around the creation of scientific revolutions are clearly a field which bears examination. This exploration of context is the vital activity of science studies. This call for inclusivity and environmentalism has never been more relevant. But it strikes the reader that since 1989 there have been two more ruptures in the march of history: 9/11 and digital tech. It will be interesting to see if Latour’s later works get to grips with a social landscape that could not be guessed at when pundits, like Francis Fukuyama, were predicting the end of history in the wake of the collapse of the Soviet Union. Latour, it should be noted clearly doesn’t buy this. In fact this book attacks the notion of a “coherent temporal flow” (ibid, p141). Whatever your interests, this book is compelling and one of Latour’s strengths is to give his writings personal relevance. This is apparent from the opening line here: “On page 4 of my daily newspaper, I learn…” (ibid, p1). But since my own research interest is the work of paleolithic man, it opens vistas which previously one might not have previously dared consider. If we have never been modern, perhaps we have never been prehistoric. His is an essay, and a call to arms, that will bear re-reading and I hope to find new applications for it in the field of archaeology; a discipline growing ever more technologically advanced around the study of prehistoric caves. I’m keen to hear from anyone else who’s read Latour. If I’ve got anything wrong, do point it out. And if you have any observations or additional points of interest, the comments section is always open!